The tour starts on the third floor. 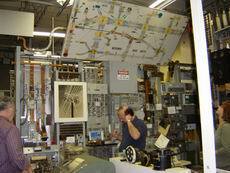 Right after you get off the elevator you start to realize that this place is really something special to a telephone enthusiast (such as myself) and start to appreciate how things used to be done prior to the modern �digital� era. We got off the elevator and entered the main room. We were greeted by a volunteer who eagerly took us on a VERY long tour of the museum. The volunteer was working on restoring an old telephone. Here's a visitor looking at it wondering what the heck it was. 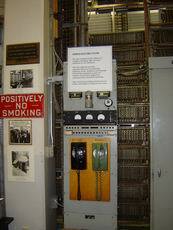 Off to the left, we see our first telephone switch. 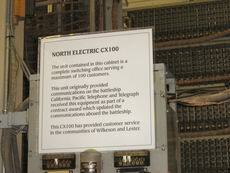 It is a North Electric CX-100 All-Relay switch. 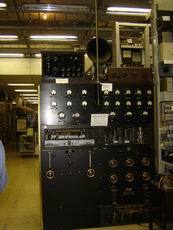 (North Electric was from Ohio - not to be confused with the Canadian Northern Electric, which later became Northern Telecom and now Nortel) This All Relay switch is sort of a cross-breed of a crossbar and a step-by-step switch. This sign says that this switch once saw service on a Navy ship, and then later as a central office switch for a small community. These phones are connected to the switch and you can make calls from one phone to the other one. I�m not sure if the switch was connected to any of the other switches. On the other side of the aisle is the Step-by-Step switch. This was the bread-and-butter switch of many small (and sometimes large) communities � from the late 1890s up until the 1970s. 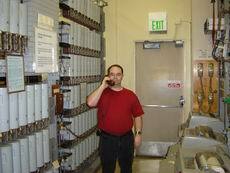 This is a picture of me making a call on the switch. The switch has modern dial tone with tone-to-pulse converters. There were several phones attached to this switch that you could call. Notice the grey �cans�. These contain the wipers that go either horizontally or vertically, depending on where in dialing the sequence it was dialed. I believe this switch was meant for party line use, where depending on the digit dialed produced a coded ring (short and long rings), but I didn�t have time to experiment with this. Continuing on the tour, we see the amplifier and carrier equipment. Notice the large map of microwave circuits in the Seattle area. Remember kiddies � we used to make long distance calls using many microwave towers, long before crystal clear digital technology and fiber optics were invented. 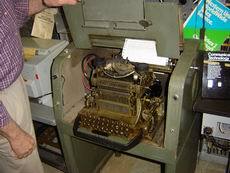 This is an old teletype machine (second picture shows the cover removed). 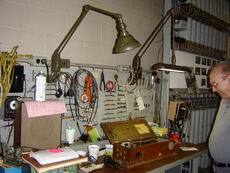 These were once used to convey news stories to newspapers, radio and TV stations across the country. 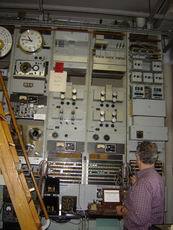 They operated at �very fast lightning� speeds of 75 CPM (characters per minute). At first, these were connected either by using dedicated lines or completed via an operator. 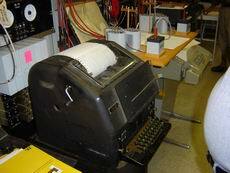 Later, Teletype machines were connected via the regular switched network. 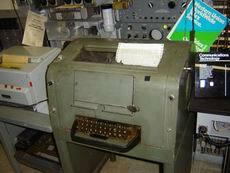 Here are two more Teletype machines. The machine on the right is printing out �The brown fox jumped over the lazy dog� as a test. And here�s the machine producing the test data. 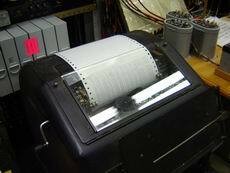 I think it uses punched paper tape for its source. 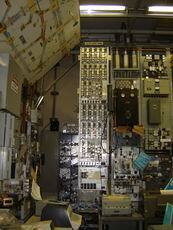 Here is a huge floor-to-ceiling rack for the N1 (pronounced �N one� carrier system. 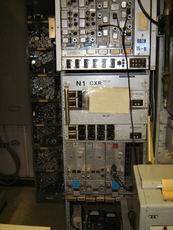 The N1 carrier system was used for multiplexing phone calls over coaxial cable. (From what I've been told elsewhere - N carrier systems carried 12 voice channels per cable for distance of around 100 to 150 miles). 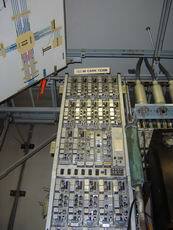 Analog multiplexing systems such as these were common before fiber optics systems came in the 1980s. 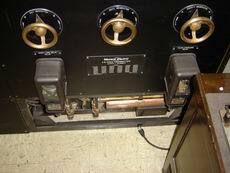 These are Morse code receivers, where a person can listen to the �dots and dashes� of Morse code. Tobacco cans were often used to amplify the sound to make it loud enough to hear. Here�s something you don�t see everyday � a table lamp that uses a Step by Step switch as a dimmer! Just �dial in� the setting you want! 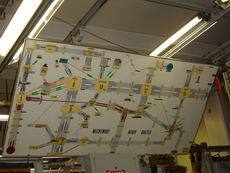 This is a test board for radio and television transmission facilities. Remember kiddies, before satellites were used to transmit radio and video across the country to your local station, they were transmitted via long distance lines. 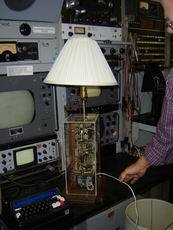 A test board like this would be set up in the central office building in a large city to monitor the quality of radio and television signals. If the signal degraded, they could monitor it and work on fixing the problem, or rerouting the signal a different way. 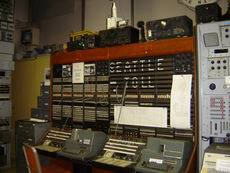 This is a picture of the old cordboard-based toll test board for the Seattle area. 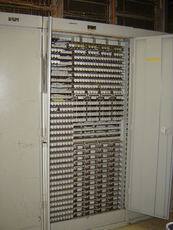 This is a test board for data circuits � back in the days when �high speed data� was a whopping 1200 or 2400 baud. 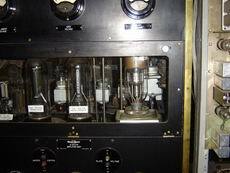 These are pictures of an old AM radio transmitter from the late 1920s. Back in those times, Western Electric (the development arm of the Bell System) branched out from just telephone systems into other areas. 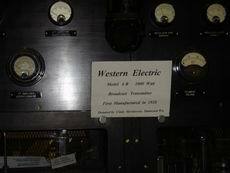 This was a 1 KW transmitter from a station that was located northeast of Seattle. 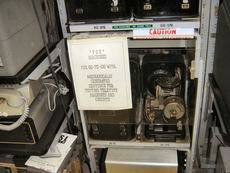 The transmitter was not used for many years and sat in an old garage. The original tubes weren�t in there, but they were found in a nearby box � intact! 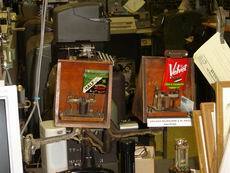 The volunteers of the museum painstakingly cleaned up the transmitter and reapplied the labels to the dials. 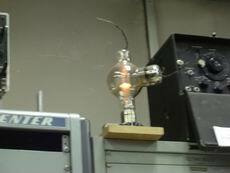 Hey kiddies � this is an old vacuum tube. 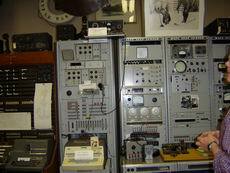 These were used before transistors and integrated circuits. Notice how it glows�.. mesmerizing�..
You�ll never know what you�ll find around here. 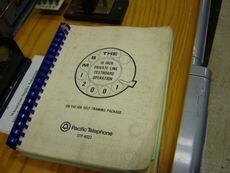 For example, look at this training manual.